For seven years while training for his life as a samurai, Toho Morimasa has been away from Aoki, the beautiful actor who helped him to heal from the trauma of his parents’ brutal murders. Now, nightmares that Aoki is in trouble plague Toho’s sleep, and he makes the journey back from Edo to Kai, no longer wanting to be away from Aoki’s side. Once there, Toho meets the very real source of his nightmares and vows to honor and protect Aoki. When his beloved Aoki is brutally assaulted, will Aoki survive long enough to understand that the love Toho has for him is the love he too has been craving his whole life but doesn’t feel he deserves? After a harrowing seventeen-year separation, Hirata Morimasa leaves his home and secure future to search for his childhood friend, Sho. 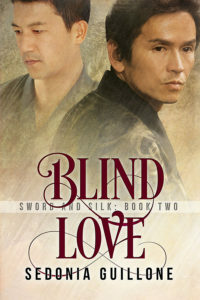 Blinded by illness when they were children, Sho was sent away, apprenticed to a blind masseur (an anma) to learn his trade, and then disappeared. 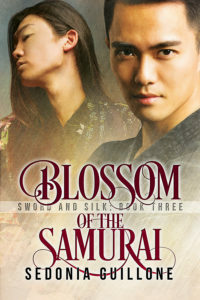 Desperate to find the other half of his heart and soul, Hirata willingly sacrifices the prestige and security of his father’s dojo to find him. When an anma who looks exactly like Sho crosses his path in front of a gambling parlor one day, the man flatly denies he is Sho. Hirata knows better and is determined to get the truth… and to get back the friend he’d lost. However, even though Hirata knows in his bones this man is his soul mate, Sho has changed in ways Hirata could not have prepared for in his wildest imaginings, changes that could continue to keep them apart… forever. First Edition published by Ai Press, 2013. This site contains ADULT content. Over 18 only. Sensory overload comes to mind when reading the amount of a sexual passion between Violette, Ethan and Charles. Between Two Captains is an enjoyable read and I look forward to future stories from Ms. Guillone.